Finally! After lots of waiting, it is now possible to purchase autographed copies of my books online. Special thanks to my husband, Gabriel Serafini, for setting up the Pay Pal system that handles the orders. We now accept credit cards and will be shipping orders via UPS. Posted in Reviews & News | Comments Off on Buy Autographed Books Online! 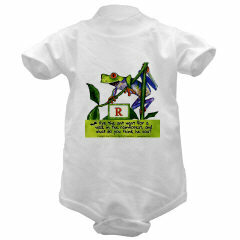 Presenting the Rainforest Romper, the first in a new line of products featuring illustrations and text from my books! I hope this will make the reading experience even more engaging and fun. You can purchase XyzAnt merchandise at www.cafeshops.com/xyzant. Saturday was beautiful here in St. Louis. The oppressive summer heat and humidity – the kind that makes a person think the big muddy Mississippi River has somehow made the air part of its floodplain – is gone. The days are cool and sunny. The best tanning weather St. Louis has to offer, and it’s nearly October. Imagine that. 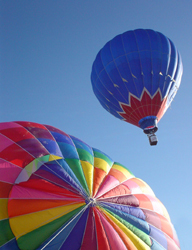 A perfect day for a balloon race, an annual event here in Forest Park. Yes, the sky really was that blue. Needless to say, not a lot of work got done on Saturday. When I visit schools to talk about my books, I am sometimes asked if I do any art that isn’t published. Here’s a chance to see what happens when I’m not illustrating or writing. I began the Caribbean Coral Reef Mural at the Principia Upper School in the when I was a high school senior in the spring of 1994. It covers an entire hallway in the Biology Department. 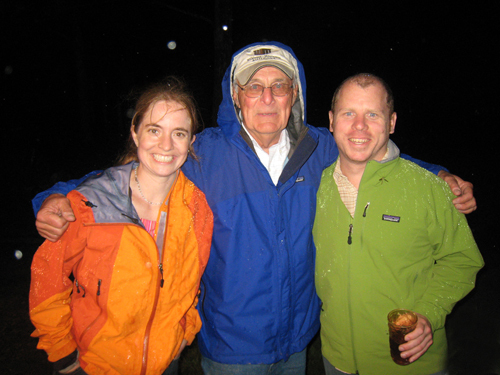 My Biology and Marine Ecology teacher, Ted Munnecke helped me get approval for the project. By the end of the summer, I finished the mural and went off to college. During the summer of 2001, Principia renovated the Upper School’s entire science department. To comply with a new school building code, a fire door was installed partway down the hall – in the middle of the mural. Some lockers were also removed, and the remaining space walled over. The current head of the Biology Department, Preston Larimer, invited me to come back and fill in the blank spaces and fix some damaged areas. It was an exciting opportunity, since painting that mural my senior year was one of my favorite parts of high school. Well, I thought I could get version 2.0 finished before school started in the fall of 2001, but here it is, a week before school starts in the fall of 2003. Oops. Took a little longer than I expected. Check out these photos of the finished mural! I added scientific and common names next to all the species, so the mural can function as a giant field guide for the students. I also added a few new animals and plants, although I did not change the composition of the original mural at all. There was some research involved, too. I wanted to make sure that I planted each animal and plant in its appropriate habitat. So an animal that lives in a cave or crevice would be shown hiding in such a location. The update took about 200 hours. I had a great time. Posted in Reviews & News | Comments Off on Mural Update Completed!